The new production of 'My Name is Rachel Corrie' offers not only compelling theatre but a searingly humane portrait of an extraordinary life, writes Hicham Yezza. At the Young Vic, London, until 26 October. Box office: 020-7922 2922. “I’ve been organising in Olympia for a little over a year on anti-war/global justice issues. And it started to feel like this work is missing a connection to the people who are impacted by US foreign policy. I just think we all have a right to be critical of government policies…any government policies, particularly policies which we’re funding.” – Rachel Corrie, diary entry. How does a young American girl from a small American town end up face-to-face with an Israeli bulldozer – thousands of miles away — somewhere at the precarious, unforgiving edges of the Gaza strip? Why did she go there? What was she thinking? What was she like? These are some of the questions that My Name Is Rachel Corrie evokes and grapples with. In late January 2003, Rachel Corrie, a 23-year-old student and activist from Olympia, Washington, arrives in Gaza to join civic resistance efforts against illegal home demolitions by the Israel Army. Less than two months later, on March 16th 2003, she’s standing between an army bulldozer and a Palestinian home. The bulldozer advances towards her, buries her under the rubble, and crushes her. Within moments, she is dead. Fourteen years later, Israel is still refusing to acknowledge any responsibility for her killing. This is the context within which My Name Is Rachel Corrie first came into being, in 2005. As a text, it is an unusual artefact: Bar a short coda, every word in the play is Rachel’s, culled from the prolific body of texts – diaries, emails, notes on napkins – she produced over her short life, and co-edited by Katherine Viner (now editor-in-chief at the Guardian), and the late Alan Rickman. Having been deeply marked by the original 2005 production, directed by Rickman himself at the Royal Court theatre, I found myself naturally attuned to any signs of echoes or dissonances in the artistic choices of this revival by Josh Roche, (winner of the JMK award 2017), and was pleasantly surprised, and thrilled, to find this an unabashedly bold and confident interpretation. That this is a production unencumbered by the anxieties of influence is signalled at the outset by Sophie Thomas’s elegantly sparse set, a departure from the 2005 production’s more elaborate, literal choices. 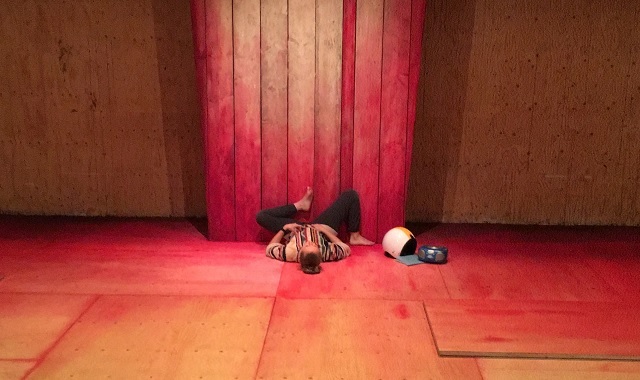 The sole (faint) echo is the stark, increasingly ominous monolith at the centre of the stage; a half-wall onto which Rachel (Erin Doherty) staples diary pages and maps, and with which she occasionally argues and spars. As Rachel, Erin Doherty is a revelation. Her performance, delightfully ludic and spontaneous, and powered by wildly infectious exuberance, is nothing short of extraordinary. The emotional dexterity on display is particularly remarkable in light of the considerable physical demands of the role —Doherty is not only the sole performer, entrusted with a chunky bit of text for an uninterrupted 90 minutes, but spends most of the play navigating, refashioning and reconfiguring her surroundings (including, on a couple of occasions, the lighting and sound). In its careful and delicate rendering of Rachel’s words, the play offers a compelling portrait of a remarkable human being. It shows us how Rachel could be both ordinary to the point of cliché — fretting over boys in high school — and utterly unique, ruminating on the meaning of time, US foreign policy, and salmon floating down water pipes beneath the streets of Olympia. From these fleeting glimpses into more than a decade of private and public musings, Corrie emerges first as a precocious, achingly-empathetic child, then as a strong-willed young woman, perfectly cognisant of the personal and political battle-lines she has set for herself. A particular delight of this production is the way Doherty brings to life how genuinely funny, arch and subversive Rachel Corrie could be; how remote she was from our prevalent notions of social justice activists as perennially humourless and morose. What the play does, above all, is show us that when Rachel Corrie stood there on that fateful day, the only obstacle between a bulldozer and a home, this wasn’t the product of freakish randomness or rotten happenstance or, worst of all, foolish whimsy. Reflecting on her views on US foreign policy, Rachel invokes an “underlying need to go to a place and meet people who are on the other end of the tax money that goes to fund the US military.” She wasn’t a dupe led astray, but someone who had meant every step of her trajectory. She was both acutely aware of the privileges her status as a Western visitor conferred upon her, and of the dangers she was nevertheless facing in her daily confrontations with Israel’s occupation army. Right to the last, she explicitly acknowledged both her hopes and plans for when she returned home, and her genuine fears that she might not leave Gaza alive. In the 14 years since her death, the legacy of Rachel Corrie’s life, and the meaning of her death, have been the subject of intense — often manufactured —controversy. A deep irony, lucidly conveyed by the play, is that Rachel Corrie epitomised, in many ways, the popular vision of the all-American female heroine: go-getting, outspoken, sharp-witted and preternaturally brave. Yet she remains relatively unknown in her own country. 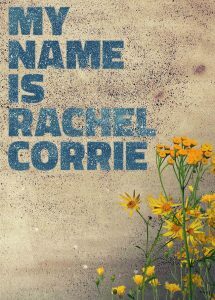 My Name is Rachel Corrie wasn’t staged in her own hometown until January of this year. One is compelled to note that, had she died facing-up to a Chinese or North Korean tank, rather than crushed by the American-made military bulldozer of an American ally, we might already have had a multi-Oscar-winning Hollywood biopic — starring Jennifer Lawrence, directed by Steven Spielberg — celebrating her all-American heroism. As this powerful and necessary production shows us, Rachel Corrie didn’t stumble upon injustice, but went looking for it. She left a sheltered and privileged existence (her own terms) and crossed half the globe on a centripetal, doomed trajectory to face it. In the end, she unhesitatingly confronted it, and paid the ultimate price for her bravery. My Name is Rachel Corrie is not only compelling theatre but a searingly humane portrait of an extraordinary life.